The best pork spare ribs should fall off the bone. Pork spare ribs are the quintessential backyard barbecue meat. The key to a great slab of barbecued ribs on your plate is knowing how to select a great slab of spare ribs at the grocery store. Spare ribs are cut from the belly of the hog, below and behind the shoulder. 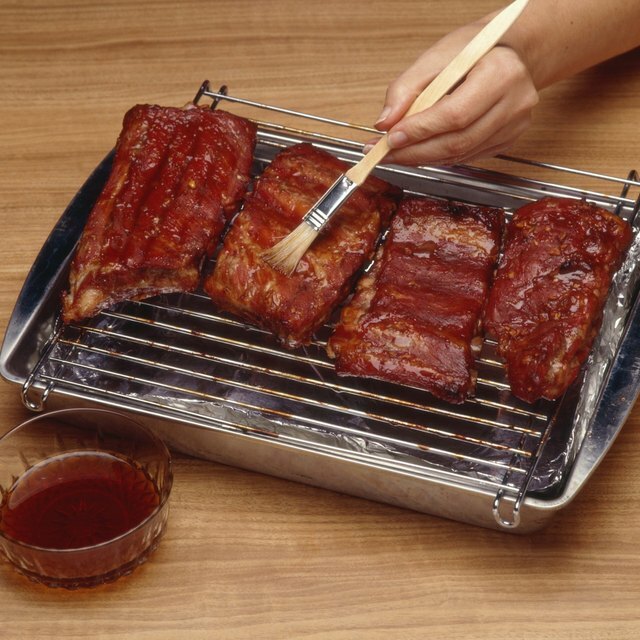 The number of ribs in a slab ranges from 11 to 13. 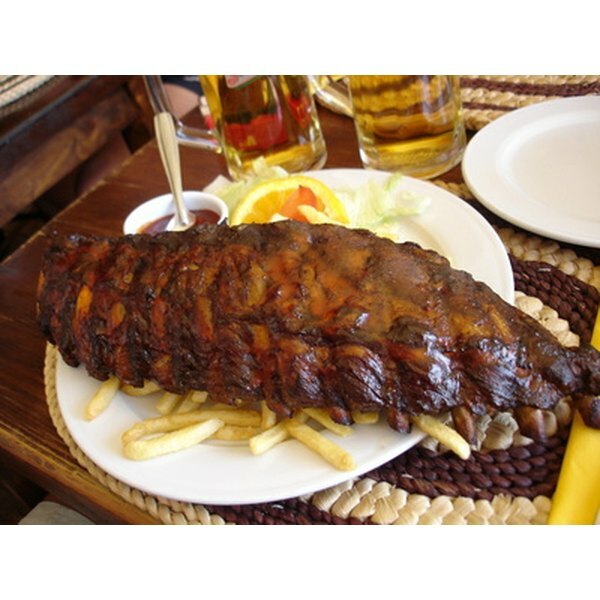 Spare ribs are extremely meaty, with a layer of meat covering the ribs and strips of meat between the ribs. The weight of a slab of spare ribs ranges from 2 to 4 lbs. The amount of trimming that the butcher does to the slab determines the type. With minimal trimming, a slab that includes the hard front sternum bone, the brisket bone along the bottom edge of the slab and a flap of meat under the ribs known as the "skirt" is simply called spare ribs. St. Louis ribs have the brisket bone removed and have a more rectangular and uniform appearance. Kansas City ribs are the most closely trimmed with the front and brisket bones removed and the pointed end of the slab squared off. Select slabs that have a thick and even layer of lean meat over the rib bones, but with no large areas of white surface fat. Avoid slabs that have been trimmed too closely. If the meat has been completely removed from the rib bones, the exposed bones tend to fall out during cooking. Be aware that certain pork processors enhance their products with a solution of water, sodium phosphate, and flavorings which is intended to make the meat juicier and more tender. Many consumers, however, do not like the flavor and texture of enhanced pork products. Estimate two to four servings per slab of spare ribs. Because they are more closely trimmed, a slab of St. Louis or Kansas City ribs will yield two to three servings. Craig Colin Smith has over twenty years' experience in technical and business writing. He holds a Bachelor of Science degree in computer science from Northeastern University in Boston, Massachusetts and a certificate in Quality Assurance Engineering from the Virginia Tech Graduate Center in Falls Church, Virginia. Mr. Smith also studied English and philosophy at the College of William and Mary in Williamsburg, Virginia. What Can I Do With Fennel Stalks? Can You Substitute Milk for Cream in Caramel Sauce?